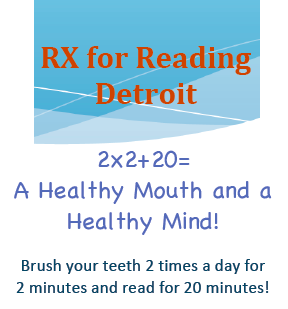 Our latest RX for Reading Library at the UDM Dental Clinic! We are thrilled to highlight our latest RX for Reading Library at the University of Detroit Mercy Pediatric Dental Clinic. Every patient at the clinic is invited to pick a book to read and take home, and parents of new patients are given RX for Reading educational materials about the importance of reading and dental health. Special thanks to Dr. Margaret Kim, DDS for spearheading the library and to all of the providers and staff at the UDM Dental Clinic for taking care of their patients’ bodies AND minds! Pictured below are clinic patients José and Marilyn and dental assistants Nakia Pace, Vernice Alexander, Lori Rosier, Simona Williams, and Theresa Richardson and dental hygienist Carolynn Zeitz (second from left). ← Thank you, Bucket Fillers!